January marks the start of the new year for our Hilltop Farm CSA program, and our thoughts and preparations turn toward the spring planting. A CSA (membership farm) relies on it's members to join in the winter months to provide the farm with "seed money" as they buy seed, fertilizer, fix tractors and so on for the coming year. In return for their support in the process the members receive a weekly or bi-weekly delivery of fresh spring and summer veggies during the harvest season. We will be accepting new members until March 1st at which time we expect our membership for the summer season to be full. We need to know how many families to plant for so that we can make sure that every member gets an ample supply of veggies through out the season. Please, visit our Join page for more details and to download the membership form. As always, you can click on the highlighted word PayPal to make your first payment and join today! All the details are on the form! After a two year hiatus, Hilltop Farms will again offer Pic-Yer-Own Organic Strawberries! This past fall, we planted 21,000 strawberry plants of three different varieties: Chandler, Sweet Charlie and Camarosa! They will be ready in May of this year and will be availble for the public to come pick. We will also put them in the CSA member's box each week and sell them at the Apex and Downtown Raleigh farmers markets that we attend! When they are done we should be about ready to start picking our organic blueberries for CSA members! Hopefully, we they will be plentiful enough to sell at the farmers markets, too. CSA members will get first dibbs on the strawberries and blueberries and will have exclusive access to the fields for Pic-Yer-Own strawberries the first week of availability! So, Join the CSA now! We attend the Apex Farmers Market and the Raleigh Downtown Farmers Market each week during their summer season. Apex is open on Saturdays from 8:30 AM to 12:30 PM at the corner of Center Street and Salem Street. The Raleigh Downtown Farmers Market is open each Wednesday from 11 AM to 2 PM in in downtown Raleigh on Fayetteville Street. Hey guys, in case you missed it we have some excellent, high quality T-shirts for sale. I know you seen them at the farmstand if you pick up here and they are also on the website for sale, but I thought I would mention it again. For the summer season you can get one for just $16! They are 100% organic cotton, grown in the USA, and the shirts are completely assemble in the Carolinas by a company in Burlington call TS Designs. They are on a mission to re-establish the textile industry in the US and do it with sustainability at the forefront. You can go to their website and see their Dirt to Shirt video that shows where and how a shirt is made from start to finish. They pioneered the first certified organic cotton ever grown in North Carolina back in 2014. So, pick them up at the farm or send an email to order one and have it shipped to you. If you are a CSA member we can even put one in your weekly box delivery! We have them in all adult sizes from medium to extra large. It'll be the softest shirt you will ever own and you can wear the message that you support "Fresh, Local and Organic"! I am happy to announce that Maximillians Grill & Wine Bar restaurant has agreed to host a box-drop-off site for our CSA this year! They are located at 8314 Chapel Hill Rd. in Cary, just two blocks from downtown and a straight-shot mile or two drive from I-40. I think this will be a convenient location on the central/west side of Cary and the new owners and longtime employees, Margie and Will Hennessee are excited to have us and eager to help out a small farm. They are also interested in purchasing produce from us. We will be delivering there on Thursdays. They will open at 5 PM and you can pick-up as late as 9 PM. Please, see the updated membership form with all the details and let me know if you have any questions. Please, join soon, spring is rapidly approaching! Time to join the Summer CSA! Wake County's first and only CERTIFIED ORGANIC farm is now open for membership. We've been operating our CSA since 1999!! Choose from seven drop sites including locations in Raleigh, Cary, Holly Springs and right here at the farm in Willow Spring. See Join page for details! 2016 CSA! Hilltop Farms is Wake County, NC's first and only USDA certified organic farm and we are now accepting new and returning members for the Spring/Summer 2016 season. At this time we are only filling spots at our farm location for pick-ups on Tuesday evenings and Saturday mornings. A weekly share of our fresh-picked veggies through our CSA membership program will start on April 16th and run for 18 weeks. The cost for a Full Share is $495 and you can join now with a deposit of just $175 and split the balance into two additional payments. Or, you can sign up for a 10 week Half Share for $295 with $175 down. There are workshare options available, too. Please visit our Join page for complete details. You can even fill-out the form and pay online! Hope to see you in the spring! One Sunday morning in Januaury, 1999 I read an article in the Raleigh N&O about CSA's. They stated that there were 7 operating in NC at that time. That May I started one, albeit parttime. I guess I was number 8, or at least tied for number 8 with 10 or 12 or 30 other farms, that may have been similarly inspired. My first year I had two members, and they split a share. The 2nd year 7 familes joined. Third - 16 . I decided to go full time in Januaury 2002. I immediately joined the CFSA. The N&O called them again regarding another story on CSA's. My name went on the list, it appeared in the next Sunday issue and by the end of the month I had 84 members! I never looked back. Almost fourteen years later, this November, I was elected to the Board of Directors of the Carolina Farm Stewardship Association at their annual Sustainbable Ag Conference. I am honored to serve such a great organization. Their mission is to connect sustainable farmers with sustainable minded consumers. They replaced five members on their board of 12. So, I guess I was tied for 8th again. Seems fitting. Hilltop Farms is in the home stretch of our Fall CSA, with 7 weeks of veggie deliveries left, starting Monday, Oct 19th. People are still signing up for the last half of the season, at the Half Share price of just $200 and it's only $160 if you choose the workshare option! So, if you have been thinking about joining a CSA but were unsure about making a season long financial commitment, now's the time to get in and test the waters at a low price and start receiving the weekly box of fresh picked, local, organic food that awaits you! There are 7 locations in the area to choose from! As the summer veggies of tomatoes, eggplant, peas, okra, and peppers continue to fill our boxes they will gradually give way to the wonderful greens of kale, pac choi, tatsoi, lettuces, radishes and others that will round out the season! Don't forget the plethora of winter squashes that adds that hearty, comfort food flare! Farmer's Market in a Box! 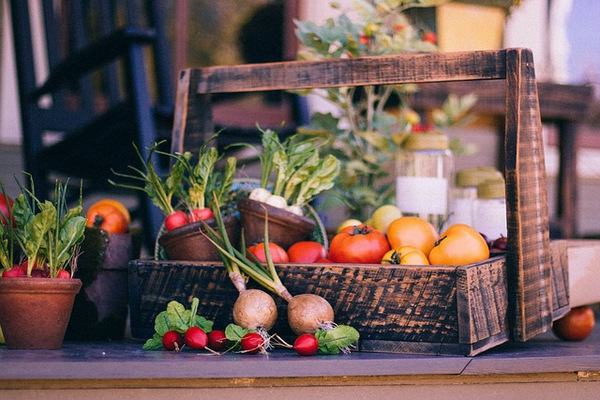 Do you love to go to farmer's markets and farm stands, but you're sad that they'll be closing for the season soon? Then join our CSA and you can extend that selection into the fall with our "Farmer's Market in a Box"! Our Fall CSA starts in a few days and extends through December. Sign up now! Our farm stand will continue to be open to the public from noon to 5 PM on Saturdays, and 4 to 6 PM on Tuesdays from now through September 1st. We will be selling the certified organic veggies listed in the harvest section of our homepage. It's officially time to sign up for the Fall Harvest CSA! Click here for more information and to join! Summer Season Drawing to a Close! There are only six weeks left in the summer season, but it's not to late to join. Information about the Fall season is coming soon! Stay tuned! The Fall CSA will start on Monday, September 14th and existing CSA members will have first chance to sign up for the fall season starting on August 3rd. Then if we still have room, we will open it up to new members on September 1st. If someone joins our Summer CSA now, they will be considered existing members and will be eligible for priority sign-up for the Fall CSA, too. Only eight weeks left in the summer season and still not too late to join our CSA! It may just be the best eight weeks of harvests we'll have all year! We currently have plenty of yellow squash and zucchini, kale and collards, mixed potatoes, and cabbage. Soon, cucumbers will abound, along with yellow wax beans, green snap beans, and Sun Gold and Black Cherry (purple) tomatoes, followed by okra, eggplant, patty pan squash, peppers, watermelons, Silver Queen corn, and eight varieties of heirloom and red slicing tomatoes. All the summer goodies! We now have Hilltop Honey for sale. It was harvested the second week of June by Matt Flint of Barton Creek Apiaries in Fuquay. Matt was able to collect 105 lbs. of honey and has bottled it in 1 lb. plastic bottles and 1.45 lb. glass jars. The cost is $12 for the bottles and $16 for the jars. They are available for sale at our farm stand during our open hours, and at Hilltop Farms' tent at the Downtown Raleigh Farmers Market on Wednesdays from 10 AM to 2 PM. It's pure, raw, wildflower honey. Matt's description of the honey..."The honey is darker this year. April nectar sources make the honey light. Our April temps were so cold that flowers gave pollen but very little nectar. The May nectar plants dominate this year's honey. More tulip tree, holly, blackberry, clover, cherry, apple and of course Hilltop's strawberries!" The farm stand will be closed on Saturday June 13th and 20th to the public, however CSA members will still pick up from 10 AM to noon. Our farm stand is open to the public from noon to 5 PM on Saturdays, and 4 to 6 PM on Tuesdays from now through September 1st (except for July 4th and 7th.) We will be selling the certified organic veggies listed in the harvest section of our homepage. Also, we should have a new supply of Hilltop Honey available by the end of June!! We had a record season and hundreds of fine families came out and picked our delicious berries. Thank you for coming out! Come pick your own organic strawberries at the farm! Due to popular demand, we've added an additional day for you to come out and harvest some delicious berries! Prices are $5/lb ($4/lb for CSA members) and we provide a take-home basket! Strawberries will be available while the season lasts. Lots of berries this year!! Come see us! Tuesday CSA spots at the Farm and Zin Yoga are now completely full, but there are still spots available at the other locations on Mondays and Thursdays. Only two spots available at the Farm on Saturdays. Sign up now and enjoy our delicious produce! Our Pick-Your-Own (or, Pic-Yer-Own if you'd prefer) strawberry season is in full swing! Our farm is now open on Saturdays from 10 AM to 5 PM and Tuesdays from 4 to 7 PM while the strawberries are in season. We will also have select produce for sale at the farm stand during those times. Prices for Pick-Your-Own berries are $5/lb for non-CSA members and starting this week $4.50/lb for CSA members. Prices for produce vary. The strawberries are certified organic, as is all the produce we grow and sell! Please come see us!! Pick-Your-Own Starts on MAY 2nd!!! It's what we've all been waiting for! We have been flooded with phone calls and e-mails asking when Pick-Your-Own will start! We will open to the public, and CSA of course, on Saturday, May 2nd at noon until 5 PM, or until all the ripe berries have been picked - whichever comes first! We'll be open every Saturday following that through May and into June, while the berries are in season, from 10 AM to 5 PM, and every Tuesday starting May 5th, from 4 to 7 PM. 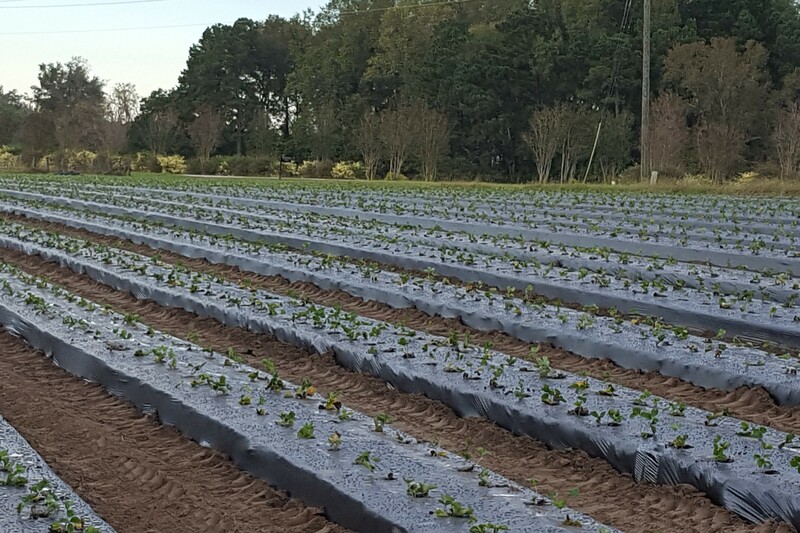 As one of only a few USDA-certified organic farms in North Carolina, we have folks come from all over the state to pick our delicious organic strawberries! Our 2015 Summer CSA starts in a few days, but it's not too late to sign up! Join now and you will be pro-rated one week. You can start to receive your produce during the week of April 25th. Be part of Hilltop's summer CSA and enjoy produce from Wake County's first and only USDA-certified organic farm! Hilltop Farms is now accepting new members to our certified organic produce CSA. It starts April 18th and runs for nineteen weeks through to the 29th of August. This is our seventeeth year operating a CSA, and we are offering full and half shares for the summer season. 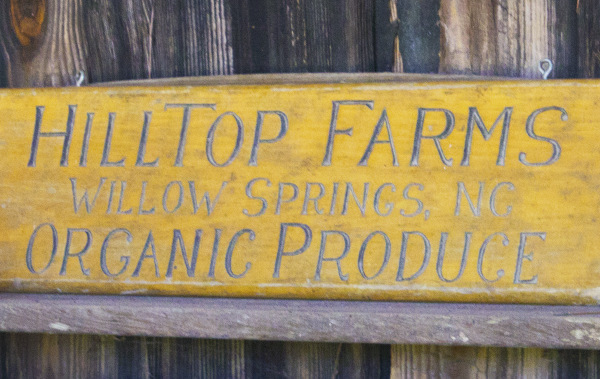 Please, email us at info@hilltopfarms.org for the 2015 membership sign-up form. The full share is $475 with weekly pick-ups at your choice of one of eight sites in Raleigh, Cary, and at the farm. We take one week off for the 4th of July. The half share is only $275 for 10 weeks, and you choose which weeks you want to pick-up during the season. You can buy additional weeks after you use up your ten, if you need them and space is available. We will also offer a twelve week Fall CSA that starts mid-September. So, send us that email now for the summer, as spring is approaching and the drop sites are filling up fast! Eat healthy! Eat organic! Buy local! In addition to organic vegetables, here at Hilltop Farms we also grow wheat and barley. Our last barley harvest was somewhat successful and we had the grain cleaned and malted at Farm Boy Farms in Pittsboro. The barley malt was sold and delivered to four Wake County breweries, and two home brew shops - keeping it local! Go to Trophy Brewing, Crank Arm Brewery, Raleigh Brewing, and Aviator Brewing, to enjoy delicious beer made from our grains. If you prefer to brew your own beer, buy our grains at American Brewmasters and Atlantic Brew Supply. Tell 'em Farmer Fred sent you!